I have what some might consider an unhealthy obsession with candles. Some people may balk at the sight of 40+ candles lining the windowsills of my bathroom, bedroom, living room, kitchen ... you get the point. But when I got the opportunity to test out a few of Votivo's new Color Collection, I simply jumped. First up: Greenpepper Coriander. Each of the candles in this collection is inspired by the color that it represents. Greenpepper Coriander is spicy and tart without being overpowering. It has a subtle zest and tang that fills up a room but doesn't overwhelm it -- not an easy feat with notes of cilantro, fresh lemons and dark green peppers! I honestly did not know what to expect when I first started burning it -- to be frank, I thought I would hate it. Luckily, I've found that this scent has a calming effect -- especially nice at the end of a long workday. The packaging is simple and classic but with a touch of elegance. I love the engraved silver top that sits over the vibrant glass green jar. Best of all, this candle has a 50-hour burn time, so I can enjoy it for many days and weeks to come! 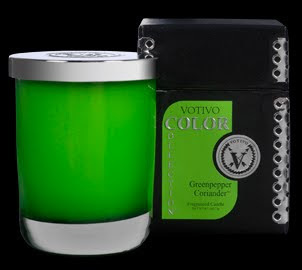 The Votivo Color Candle in Greenpepper Coriander retails for $25. Oh, dear. Now I'll need to obsess over THIS CANDLE?! You're killing me, woman. MURDER here.